Review: Canon XF205 Professional Camcorder – Vancouver Video Production Company – Shawn Lam Video Inc. 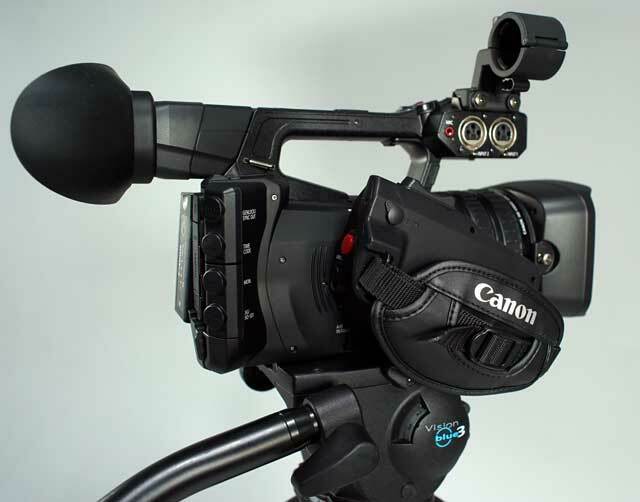 The Canon XF200 and XF205 were announced at NAB 2014 and are the larger professional versions of the prosumer Canon XA20 and XA25 camcorders that were announced at NAB 2013 and went on to win several awards and numerous accolades in the trade press. I was so impressed with the XA20 that I purchased one and have written about it and recommended it several times in various Streaming Media and Streaming Media Producer articles. The XA20/25 and XF200/205 share a lot of components and features so I already know going into this review that I will consider it a strong performer. The picture quality is very good and having a long zoom lens comes in handy when you need to film a speaker from the back of a conference room. Having had the opportunity to review the XF205, in this article I will compare and contrast the XA20/25 and XF200/205. The technology and feature set in 1/3” sensor-class camcorders is fairly mature compared to large-sensor models. As a camcorder class matures, professional users look more and more to refinement and less on consumer-centric features that lack predictable results. I’ll focus mainly on the features that matter to me the most in my own workflows and skip over some of the ones I might think are cool but honestly would never use. Before I delve deep into the manual and a camera’s menu system, I like to hand hold a camera to test its ergonomics. The camcorder form factor’s biggest asset is its form factor and that they are designed to be balanced and easy to hand hold. As a Sony FS100 and FS700 owner, I know the pains of owning cameras that cannot be handheld without a rig and external monitor system. This is largely the reason that I bought an XA20. The side LCD placement and overall light weight of the XA20/25 make it easy to operate off a tripod, although some might find it is too light. The XF200/205 weighs about 6lbs fully equipped and the XA20/25, just over 2lbs. More importantly, the XF200/205 has a hand grip that can be rotated 120 degrees, and I appreciate this because it allows me to orient the hand grip to an ergonomically neutral and stronger wrist position than the typical wrist abduction (thumb-sucking motion) position that most hand grips require. A neutral ergonomic position allows you to keep the shot steadier for longer because you are shifting the muscle burden to larger and stronger muscles and smaller muscles aren’t contracted for extended periods of time. Stable body positions are an important start for when you pair a 20x lens with a camcorder but you will need more than just an ergonomic hand grip and neutral wrist position to get stabilized handheld shots. It used to be that the big differentiating feature in professional camcorders was that they featured three sensors. Light from the lens would first pass through a color-separation prism, which would split the signal into the primary colors of red, blue, and green. Each of the three sensors would be tasked with handling only one color value. This resulted in better color reproduction than consumer single-sensor solutions. The use of three sensors was leveraged with both CCD technology and more recently with CMOS technology. The exception in use was DLSRs and large-sensor video cameras, but now Canon is bringing their single-sensor color technology to camcorders and this reduces cost, size, weight, and permits the use of additional forms of image stabilization that weren’t possible when using three sensors. I mentioned earlier that the XF200 and 205, like the XA20 and 25, are 1/3”-class camcorders. Their sensor is actually a slightly larger 1/2.84” CMOS sensor, but the additional size and resolution are used to provide lossless stabilization on the sensor, in addition to more traditional optical lens stabilization. In digital stabilization systems the camera zooms on the image slightly in order to add stabilization. This method is effective, but there is a resolution loss as the image is not oversampled to begin with. The Canon XA20/25 and XF200/205 sensor stabilization starts with a sensor that is effectively 2136×1362 and when this image is scaled and then cropped, the final resolution is a pixel-to-pixel 1920×1080. I normally would not recommend trying to film at 20x zoom handheld, but the dual stabilization is so good that I have successfully tracked flying planes and swimming dolphins while on a cruise ship. The Canon XF205 competes with the Sony NX5U and the Canon XF200 with the NX3 and they have similar MSRPs, respectively, in the $4,000 and $3,500 range.